Of course we need trade agreements. Fair, not free ones. Cities, civil society, social partners are natural allies for a global fair trade system. Mid-July was an interesting time in Brussels. 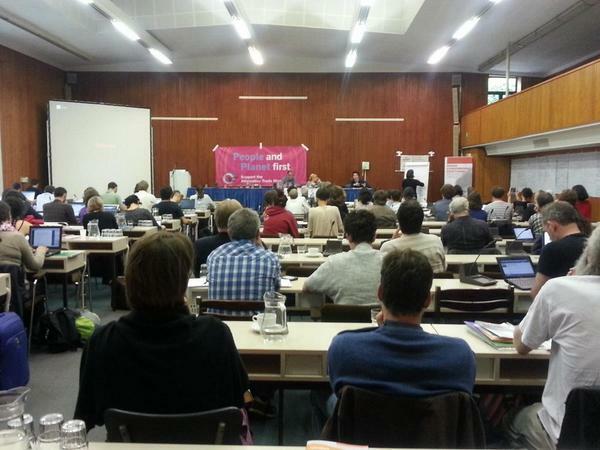 The beginning of the week saw a big gathering of civil society organisations joining forces against TTIP, TISA & co. They met in an Ixelles based, rather poorly equipped NGO headquarter, their outfit was casual and relaxing, discussions were open minded and inclusive. Some things were chaotic, like the WIFI would not work properly all the time, but that did have no impact whatsoever on the quality of discussions in real time. This impressing 2-days-meeting with 200 activists was followed by yet another one of these perfectly orchestrated „EU stakeholder meetings“ on TTIP, as the main negogiators met in the same week in Brussels, grey/black suits and perfect PPPs galore. In the light of this interesting week, it is worth to look at the question why the strategic alliance of cities, civil society and social partners in a multilevel political and even transatlantic context is so important to influence and even change global trade relations. Kategorien: Städtepolitik | Tags: cities, demokratie, europäisches parlament, public services, rule of law, ttip, urban agenda | Permanentlink. Der ORF hat eine Übersicht zu den Wahlergebnissen in Österreich, die Sie hier finden. Auf ARD gibt es Links zu Ergebnissen in Deutschland und Europa – hier. Das Europäische Parlament hat Länderergebnisse und weitere Informationen – hier. Wie der europäische Fahrplan insgesamt voraussichtlich aussieht, können Sie hier nachlesen. Kategorien: Kunterbuntes | Tags: eu-wissen, europäisches parlament | Permanentlink. Kategorien: Kunterbuntes | Tags: eu-wahl, europäische kommission, europäisches parlament | Permanentlink. Das Innenministerium veröffentlicht das vorläufige Endergebnis zwar erst um 23.00 Uhr. Aber die vorliegende Teilergebnisse werden bereits ab 17 Uhr bekannt gegeben. Das inoffizielle Endergebnis wird – wie bei anderen Bundeswahlen – voraussichtlich gegen 19.30 Uhr vorliegen. Noch nicht enthalten sind darin die Briefwahlstimmen und die in fremden Wahlkreisen abgegebenen Wahlkarten; sie werden erst am Montag ausgezählt. 23.00 Uhr ist der europaweite Wahlschluss, bis dahin haben in Italien Wahllokale offen. Hier geht es weiter zu den Landeswahlbehörden der Bundesländer. Hier geht es weiter zur Wahlnacht in Brüssel und den Terminen von SPE und S&D am Montag. Kategorien: Kunterbuntes | Tags: eu-wahl, europäisches parlament | Permanentlink. The PES and the S&D Group will be making several of our members and spokespersons available to the press on election night (25 May) and on the following morning (26 May). PES Commission Presidency candidate Martin Schulz and S&D Group President Hannes Swoboda will be among those present on the night. Kategorien: Kunterbuntes | Tags: eu-wahl, europäisches parlament, pes_spe, s&d | Permanentlink. I had the opportunity to talk to Sogol Ayrom, a bright Iranian Austrian woman, on issues of social justice and human rights recently. Feel free to read more about our conversation here. Kategorien: Kunterbuntes | Tags: eu-wahl, europäisches parlament, frauen, gleichstellung, international, iran | Permanentlink.